The larynx, together with the epiglottis, tongue, mouth, and lips are the principal organs of speech. A side view (A) and back view (B) of these organs are shown. Air pushed out from the lungs through the larynx causes the vocal cords to vibrate, producing a continuous singing tone, the "voice". 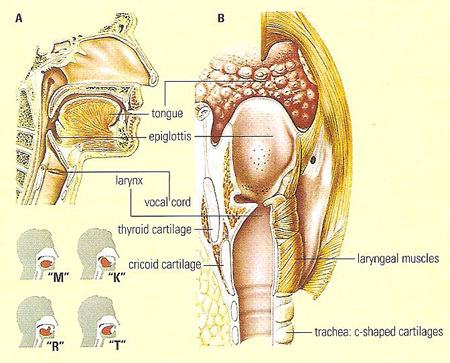 This tone can be altered in pitch by varying the arrangement of cartilages of the larynx (thyroid and cricoid) by action of the associated muscles. As air passes through the mouth, the voice is modulated and broken up by changing the position and shape of the other organs to produce speech. The different vowels are produced by altering the shape of the mouth. Consonants (four shown) are formed when the stream of air is suddenly emitted or cut off. The voice is the sound emitted in speech and song, a method of communication exclusive to Homo sapiens. It is dependent for its generation upon the passage of air from the lungs through the trachea (wind-pipe), larynx (voice box), pharynx (throat), and mouth (including the epiglottis, tongue, and lips) and its quality in each individual is largely determined by the shape and size of these structures and the resonance of the nose and nasal sinuses. Phonation is the sounding of the elements of speech by the action of several small muscles on the vocal folds (vocal cords) of the larynx; these regulate the air passing through and vibrate when tensed against this air stream. Articulation consists in the modulation of these sounds by the use of the tongue, teeth, and lips in different combinations. Vowels are produced mainly by phonation while consonants derive their characteristics principally articulation.